Originally published in 1979, this volume represented a unique attempt to connect the usually separated fields of infancy studies and studies of older children. In each chapter, eminent research workers attempt to cross the theoretical, empirical, and methodological barriers that had traditionally separated the study of preverbal infants from the study of verbal children and adults at the time. These completely new and original contributions traced the developmental links between birth and conversation within three major categories: perceptual, cognitive, and language development. Although the chapters range from reports of well-defined research areas to theoretical propositions, the aim throughout was to relate the events of the first year of life to the child’s later perceptual and cognitive activity. 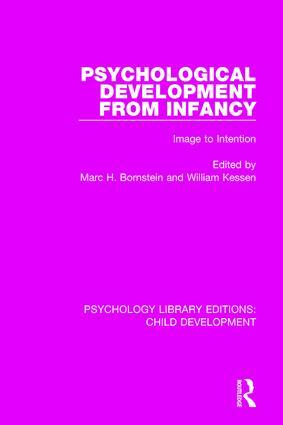 This book will still be of interest for all concerned with child development and related areas, in that it demonstrates the remarkable range of observations about infants brought under a single guiding set of questions about continuity, stability, and the sources of change during and after the first year of life. Series Prologue. Preface. 1. Introduction William Kessen Part 1: Perceptual and Motor Development 2. Perspectives on Infant Motor System Development Claire B. Kopp 3. Perceptual Development: Stability and Change in Feature Perception Marc H. Bornstein 4. The Origins of Facial Pattern Recognition Joseph F. Fagan, III 5. Spatial Reference Systems in Perceptual Development Herbert L. Pick, Jr., Albert Yonas and John Rieser 6. Commentary Eleanor J. Gibson et al. Part 2: Cognitive Development 7. Structure and Process in the Human Infant: The Ontogeny of Mental Representation Jerome Kagan 8. Qualitative Transitions in Behavioral Development in the First Two Years of Life Robert B. McCall 9. The Figurative and the Operative in Piagetian Psychology David Elkind 10. From Adaptive Responses to Social Cognition: The Learning View of Development Hanuš Papoušek 11. Commentary Paul Mussen Part 3: Language and Social Development 12. Acquiring the Concept of the Dialogue H. Rudolph Schaffer 13. The Role of Language in Infant Development Katherine Nelson 14. Dialectical Approaches to Early Thought and Language Arnold J. Sameroff and Adrienne E. Harris 15. Commentary: A Trialogue on Dialogue Jean M. Mandler. Biographical Notes. Author Index. Subject Index. Psychology Library Editions: Child Development (20 Volume set) brings together a diverse number of titles across many areas of developmental psychology, from children’s play to language development. The series of previously out-of-print titles, originally published between 1930 and 1993, with the majority from the 70s and 80s, includes contributions from many respected authors in the field and charts the progression of the field over this time.